I recently read an article that suggested that gardening with perennials is one of the big trends for 2015. Really? This is a new thing? Finally I’m ahead of the curve, because I thought everyone was gardening with perennials. I live in Ohio. We don’t lack for water, but even so I was raised to be conservative with my water use. I also hate to haul water, let’s be honest. When you plant a native perennial, it tends to fend for itself. Watering is required while the roots are getting established, but after that the plant is perfectly adapted to the amount of water it will receive in your environment. Did you know the plants that are native in your area are specifically designed to work with the pollinators living there? Strategies can range from colors, to time of day that blooms occur, size and shape of the flower, and even triggers that are set off when a certain sized insect enters for a nectar treat. Planting specimens that don’t belong could mean that your local pollinators can’t get at the goodies inside because they aren’t designed to get at them. In contrast, native perennials provide our native pollinators with food throughout the growing season. If you plant perennials they survive over winter, or at least that’s the idea. This means that you don’t have to go to the plant nursery every year to plant your front garden. Instead, your perennials pop up and provide color and texture without any help from you. Many people think it costs more to focus on these long lived plants. It is indeed more expensive initially, but in the long run when you aren’t buying plants that are destined to die in the cold, you win! Two of the big trends in gardening is in planting perennial vegetables and healing herbs in amongst your landscaping plants. My latest book, Heal Local, can teach you how to plant these natives in your flower beds or vegetable gardens for years of health support for your family. Mother Earth magazine has published many articles that discuss perennial vegetables. Vegetables such as pumpkins and kale will come back year after year. Imagine planting your vegetable garden once and harvesting for many years after that rather than buying annuals every time and starting all over! Perennials spread and reproduce. Buy once and you have an endless supply of plants that can be split and spread around your yard to other flower beds or to the yards of your friends and family. I guarantee you have people in your life who feel and express love with plants. Grow with perennials and there will always be love to share! How about you? 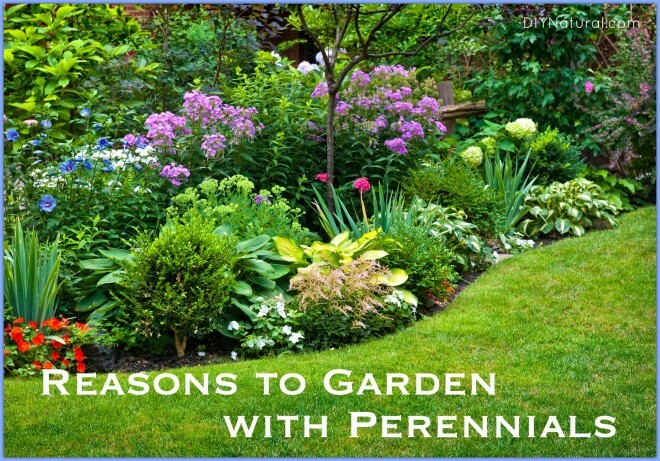 Do you garden with perennials? If so, what are your favorites? I planted bee balm last year just because I think it’s pretty. Come to find out it’s edible! I occasionally use some in tea. It has really thrived since it’s a native plant, and the bees love it.